Spring is finally here you say? Well, not around these parts. It’s cold and wet, and there’s snow on the ground—comfort food weather. And is there anything more comforting than melted cheese? Sauté the onion gently in the olive oil or lard or minced lardo in a skillet (nonstick is best) until soft and translucent, along with the pancetta, guanciale or speck if using. Add the cheese and fold it well into the potato and onion. Stir from time to time over gentle heat until the cheese melts completely. Continue simmering for another 5-10 minutes, until the mixture has thickened enough that it forms a solid mass. Serve immediately, while the cheese is still warm and creamy. The star of this dish is Montasio cheese. This cow’s milk cheese has been around since the 13th century, traditionally made by monks living in the Moggio abbey, located in the Carnic Alps staddle Friuli and neighboring Austria. The cheese takes its name from the nearby mountain named the Jôf di Montasio. A young Montasio is aged 2 to 5 months, producing a mild tasting semi-hard cheese. An older Montasio is aged 12 months, producing a hard grating cheese with a much sharper flavor. It’s the young type you will want for this dish, although some recipes call for a bit of the older type, too, for flavor. Montasio can be hard to find in stores, although you can order it online. Otherwise, you can substitute another mildly flavored semi-hard Alpine cheese like Emmenthal or gruyère or a young Asiago, or perhaps a Fontal. Any meltable cheese that you like, really, will produce something delicious. After all, with sautéed onions and potatoes and melted cheese, how can you go wrong? There are any number of ways to make frico. There are different ways to treat the potatoes. They can be sliced, cut into chunks or grated rather than diced, each producing a different texture in the final product. In some recipes, you boil or steam the potatoes separately, then add them to the sautéed onion, let them sauté gently for a few minutes, then add the cheese and proceed from there. Some recipes call for a two pot method: You cook the onion-potato-cheese mixture over low heat in a saucepan over low heat, and then brown it in oil over higher heat in a separate skillet. The cheese content varies widely from recipe to recipe. Some call for a very cheesy frico, with a 1:1 ratio of potato to cheese, double the 2:1 ratio shown here. 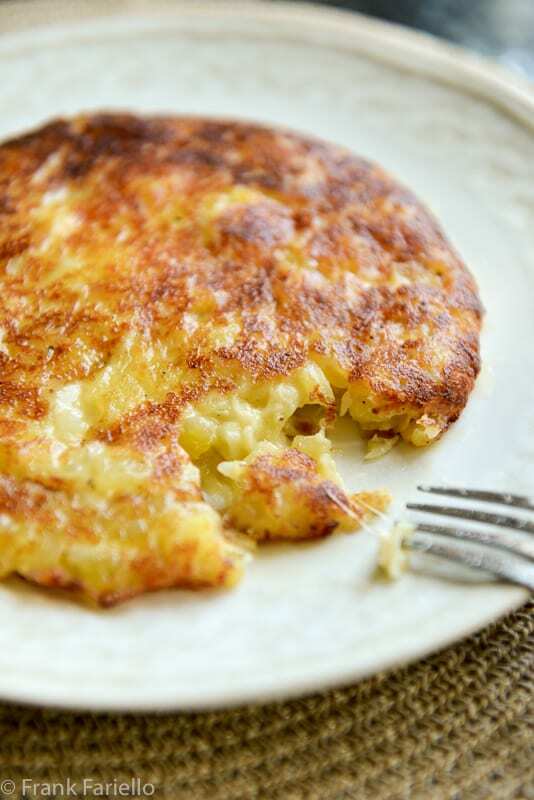 And if you’re a real cheese maven, you could try this potato-less version of frico from Eleanora Baldwin. NB: There is another, quite distinct dish also called frico. It is made entirely from Montasio, usually the hard, aged variety, but sometimes using a mix of aged and semi-aged cheeses. You fry the cubed or grated cheese in a non-stick skillet over moderate heat until brown on the bottom, then flip it over and brown it on the other side until you have a thin, round crisp. If laid over a small bowl to cool, the crisps form a basket. Otherwise, you can lay them on paper towels to absorb the excess grease and serve them as an antipasto or snack. Sauté the onion gently in the olive oil or lard in a skillet (nonstick is best) until soft and translucent, along with the pancetta or speck if using. Add the potatoes and mix together with the onions. Season generously with salt and pepper, then add a glassful of water and cover. Let the potatoes simmer until soft, adding more water if necessary. Uncover and let any remaining liquid evaporate, smashing the potato with a wooden spoon into a very rough purée, leaving some of the potato dice whole. Thank you again and again for these recipes! You made me really love the Italian cuisine. Best wishes from Romania, Sir! We have a foot of snow on the ground and more coming on Sunday. (Momma Mia!) so this recipe is pure comfort for me. Bring me some melted cheese. Will be stopping at our cheese shop this weekend. I love this. DROOLING over the photos dear Frank! :) We both love cheese ourselves, so we’re definitely gonna try to find Montasio, for an authentic taste. If we can’t we’ll use Naxos graviera (sweet, mild) or even a Dubliner(sharper)-mild Cheddar combo. Yep, although it’s “apparantly” spring here in Scotland, it most definitely isn’t weather wise! It’s freezing outside. THIS is just the perfect comfort food I need. Potatoes and cheese all melted together. Yum!! Frank you are killing me with this recipe, it’s 11:30 pm and I suddenly feel ravenous. I should not read your blog after dinner! Ha ha! Or just indulge… Thanks for stopping by, Letizia! A favorite of Mio Marito’s any time of the day or night. Dear friends from Friuli generously carry the wonderful Montasio back for us, such a treat. This looks so good! I might have this during some warm months, too. Any excuse for potatoes and cheese!!! This recipe reminds me of Rösti potatoes. We had one in a small town Swiss restaurant that they literally stuffed with cheese, it was awesome! I’m definitely bookmarking for a dinner party starter. Thanks, Eva. I didn’t realize that Rösti was made with cheese. They do sound a lot like frico that way. I’ll have to try them soon. Yes, almost… lol! Thanks for stopping by, David. My goodness, this sounds like the most incredible comfort food. And your pictures are gorgeous. This is comfort food at its best. What an interesting way to cook a potato pancake filled with cheese, it must be so delicious. I have to try it. I do heartily recommend it, Gerlinde, if you like cheese! This is such a delicious and simple dish. I remember eating it first in Cividale, up in the Friuli region, where it is omnipresent. It’s quite heavy though, so a little goes a long way. This looks fabulous, Frank! And good news for everyone – I just found young Montasio cheese in Trader Joes! Are used it when making ricotta gnocchi. Sorry your spring weather is more winter-like! You should come to Tucson! I have to admit, I never did make it up there, although I think I’d really enjoy it. Will have to remedy that some day! Fricking frico sounds FABULOUS! Haha! OMG, this is sooooo my thing! Love potatoes and cheese so much, in fact, I made gattò di patate TWICE this past week! Have you ever had that, Frank? My mother found the recipe in Il Cucchiaio d’Argento (I have it on my site). Like you said, pure comfort food! Will be making this for sure! Thanks, Christina! This is my kind of things, too. And yes, I’ve had gattò and indeed have even blogged about it.. Another great cheese and potato dish! I’ll have to check out your version. I’ve never had this dish! Looks perfect for the weather we’re having too — no snow but gloomy, rainy, chilly. This should perk things up! Thanks so much. It certainly should, John. Thanks for stopping by! grazie infinite per aver fatto conoscere ai tuoi lettori una ricetta tipica della mia regione , il Friuli Venezia Giulia è un territorio così unico e particolare, luoghi e gastronomia che restano nel cuore di chi lo visita, buon we Frank, un abbraccio ! Prego, Chiara. È certamente una cucina che merita di essere più conosciuta!